Libertarian Ticket: "A Breath Of Fresh Air"
Editor's Note: Connor Hoffman contributed to this post. For those Americans dissatisfied with Donald Trump or Hillary Clinton as possible Commander-in-Chiefs the Johnson-Weld ticket may be the “breath of fresh air” they are looking for in this election. “People want to vote for someone as opposed to a lesser of two evils,” said Governor Gary Johnson during a luncheon at the National Press Club today. Johnson-Weld is currently polling at a ten percent average on the national level. 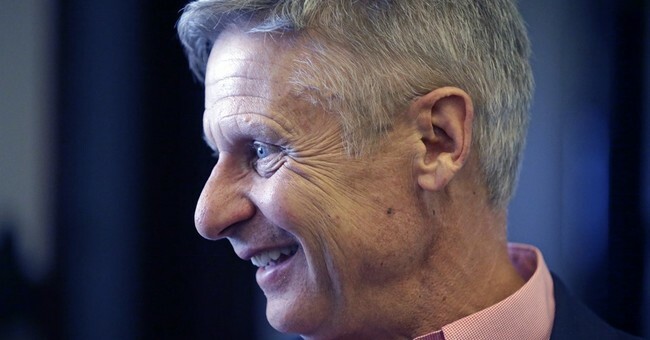 The Libertarian party has always had a candidate, but rarely any with as much presence or traction as Johnson in 2016. This is the first year the Libertarian party will be on the ballot in every single state. Gary Johnson and Bill Weld need fifteen percent in order to participate in the national debates. While the two governors are confident they will break that number, they are currently suing the Commission on Presidential Debates for a change in regulation: A candidate should have a certain amount of favored states in order to mathematically win as opposed to a national percentage to qualify. The team expressed their distaste for the two party system and how difficult it is to be heard among the loud bickering between the Republicans and Democrats. They argued Republicans do not fight for small government despite their claims to and Democrats don’t follow through on their anti-intervention ideals. While the candidates explained why they are Libertarian as opposed to Republican or Democrat, they also placed importance on the way they intend on running their administration. “We plan on governing as a team.. so this is a two for one deal as I like to say,” said Gov. Johnson. Johnson and Weld pride themselves on being honest and transparent leaders in addition to being genuine. “Beyond my wildest dreams Bill Weld is my running mate," said Gov. Johnson. "He was a role model for me prior to becoming governor, and I have always held Bill Weld on a pedestal. The fact that he is my running mate, I think adds incredible credibility to this run." Regardless of political affiliation, we cannot overlook the rising popularity of this Libertarian ticket. “This is for real and this will make a difference. Give us a chance and we will make a difference,” said a confident Governor Johnson.